Birmingham lawyer Clark Cooper, left, tiring of the legal rat race and seeking a change found a perfect opportunity when he learned Bedzzz Express founder Keith Krininger, right, was ready to sell. Journal photo by Jordan Wald. 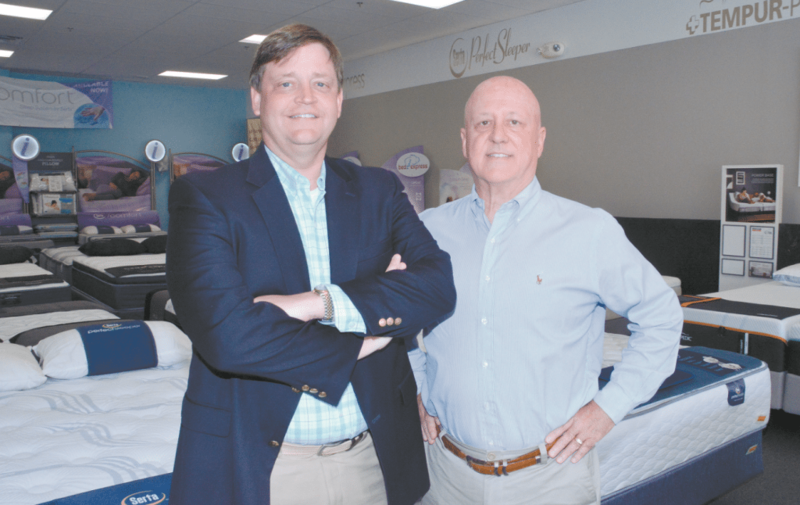 After 23 years of building up one of the most well-known retail mattress companies in the Southeast, Keith Krininger was ready to sell. Neither health nor finances were a factor; he simply felt the time had come to give up the daily grind and reap the rewards of his hard-won success. Provided, that is, the right buyer came along. You see, Krininger’s company, Bedzzz Express, had been his life’s work for 23 years, and he wasn’t merely an overseer. He was heavily involved in the day-to-day operations, including buying, merchandising and advertising for every store the company opened. So, considering the massive amount of time and effort he’d invested, he naturally didn’t want to sell to just anybody. “From day one, I liked the idea of a good local family buying the business and keeping the name,” he said. Enter Clark Cooper, a Birmingham lawyer tiring of the legal rat race and seeking a change. Long story short, the two men met, a deal ultimately was struck, and neither could be happier with the outcome. Krininger got the kind of buyer he wanted, and Cooper got a local company with a product needed by anybody who owns a bed. And as a bonus, each of them made a new friend. As for Cooper, he fully recognizes the value of keeping the prior owner and a host of experienced employees involved in the operations. Krininger founded Bedzzz Express in 1995 after working for 10 years as a Serta sales representative. There are now 50 Bedzzz Express stores across the Southeast, 34 of them owned by licensees. Over the past two decades and longer, the company has built its reputation by offering the best mattresses at the best prices, along with its exclusive Easy as 1-2-3 plan, the best return policy in the industry. Inventory includes top brands such as Serta, i-Comfort, Beautyrest, Sealy, Optimum, Tempur-Pedic, Stearns & Foster and Bedzzz by Orderest. The company also is known for honoring the human factor – customers, as well as individuals in need. The company slogan, “Where Dreams Begin”, likely means more to Cooper since he started his new job at Bedzzz Express in mid-March. For more information on Bedzzz Express, visit bedzzzexpress.com.